There are 2 things that I love in Golden Tour slot: first, it is very simple and fun to play. Second: the RTP. 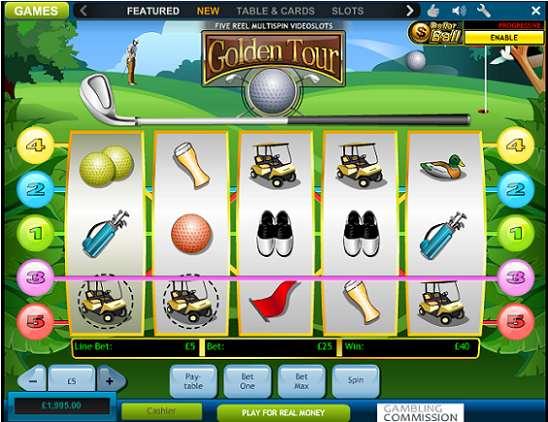 Golden tour slot is the loosest Playtech video slot at the moment, with 97.7% payout. The game is part of Dollar Ball progressive network and can be played in both, non progressive and progressive mode. Edit: here you can find some free slots to play, no registration and no download required. 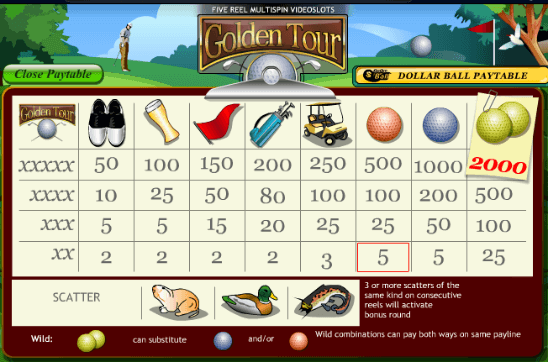 Golden Tour is a simple 5 reel, 5 paylines Gold themed video slot. This is one of the simplest slots in terms of design and bonus features, especially if you compare it to various 3D slots. All the symbols are taken from Golf scenery. The highest paying symbol is the double golden ball, followed by blue and red balls, golf cart, clubs, etc… There are 3 scatter symbols which are represented by a catfish, dukes and gophers – we have no idea why. The lowest denomination is $0.01, great for penny slots fans, and it goes up to $25. You can control the number of pay lines therefore the minimum bet is 1 penny and the maximum is $125 per spin. The maximum jackpot during the regular play is $10,000. If you choose to enable the progressive jackpot than you can win much higher amounts. You can play this game through Golden Tour slot free download version or using the instant play mode. As you said, the slot has 3 different scatter symbols: The Gopher, Duck and Catfish. 3 or more scatters of the same kind on 3 consecutive wheel activates the bonus feature . During the bonus you will need to choose a driver, an iron and then a putter. You will win a prize based on the clubs you chose. If you had 4 scatters: all your wins will be tripled. If you triggered the bonus with 5 scatter symbols, you will get a cool x10 multiplier. If you wish to play in progressive mode, all you need to do is click on the enable button at the top of game. Then you will need to pick 5 numbers out of 49. Now every time you spin, the numbers will be drawn randomly. If you guessed all 5 numbers – you win the jackpot. With 97.7%, this is one of the best paying slot machines online. This RTP refers to non-progressive mode. If you choose to go for the big jackpot, please expect lower payout. It’s ironic, but despite the high RTP, the bonus feature are very hard to trigger. On the other hand, you get paid almost every spin. Golden Tour is available on all mobile devices: iPhones, Ipads, Android, Blackberry and Windows phone. Due to it’s simplicity and clear design this is a great slot to play on the go. One of the most simple and loosest slots online. The design is a bit too simplistic and the bonus rounds are quite rare, but you can hit spin after spin without worrying the you lose all your balance within minutes. 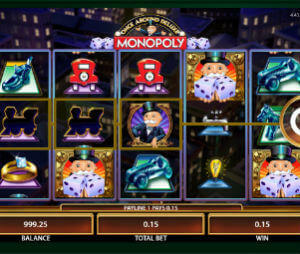 If you get lucky to hit few bonus rounds – you can end up with nice winnings. Progressive jackpot mode adds another layer of thrill and excitement, but lowers the RTP.